Macao defies clean classification. Other full-bodied designs feel cluttered but Macao’s myriad of mechanics (action point allowance, card drafting, network building, pick-up & deliver, dice dice rolling, cube allocation, etc.) work for me. 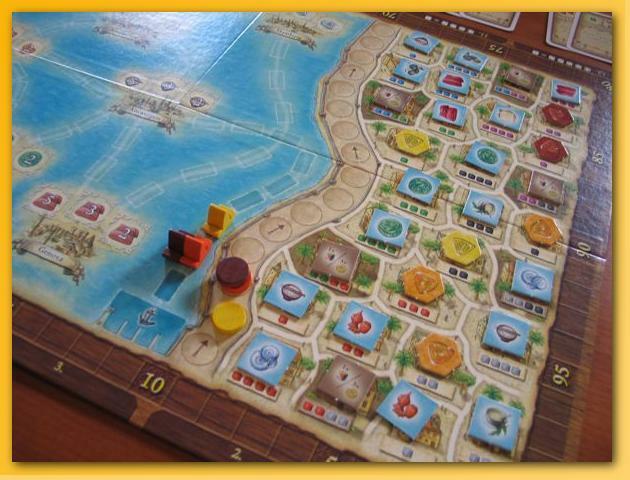 Players take on the role of 17th century adventurers in the Portuguese port city of Macao on the southern coast of China. Each player is tasked with collecting, you guessed it, the most prestige points. In my opinion, the theme adds nothing to the game and can be ignored. Did real 17th century adventurers really vie for prestige points? 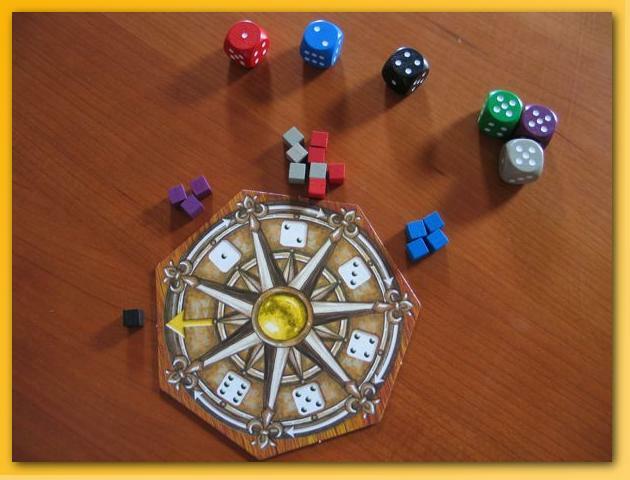 Macao lasts 12 rounds with 3 phases: cards, dice, and actions. In the card phase, the appropriate pair of cards for the round (dealt randomly and placed in the 12 slots around the board) are laid out and an appropriate number of building/person cards are placed face up. A “tribute” value is calculated for use during the action phase and depending on the number of players, some cards may be discarded. 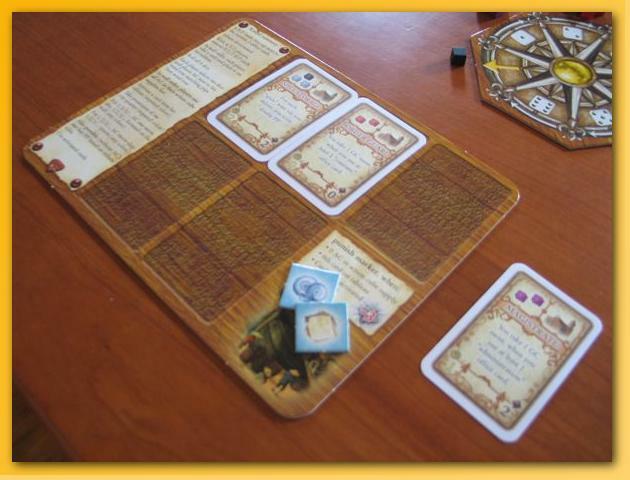 Then, in order of the furthest token along the “wall” and working backwards, players must take a card of their choice and place it on their own player mat in one of the free spots. There is a penalty if you don’t have a free spot but you must still take a card. The drafted cards require the player to pay the appropriate number of cubes in the appropriate colors before the card can be put into play (activated) and removed from the mat opening up a slot for subsequent drafting. Once a card has been activated, the special ability on the card can be used once during each “action” phase. At the end of the game, unactivated cards count against the player. In the dice phase, the six differently colored dice are rolled and each player chooses two dice and picks cubes of the matching color and in the same numbers as pips on the selected die. The cubes are placed in the segment of their personal windrose that matches the number of cubes (e.g. if you chose 5 purple cubes, they’re placed next to segment 5 of your wind rose.) In this way, most cubes won’t be used until several turns later when the windrose is rotated to point at them. Every player rotates their windrose one segment clockwise and the cubes indicated by the arrow are now available for the subsequent action phase. The action phase is taken by each player in turn order (again the farthest along the wall and working backwards). Players use the cubes for this turn and can, in most cases, execute an action as many times as allowed. The allowable actions are: move your boat, take control of a city segment, activate cards, use the action of (tap) a previously activated card, deliver collected goods by moving a boat into a harbor, buy points using the current round’s tribute track value, and move forward on the wall (affecting turn order). The more activated cards you have the more complex your turn can become while you try to weave in those actions in-between other actions to maximize what you can accomplish. My first play of Macao was tedious. The rules overview drug on for far too long for what seemed to be a rather straightforward game. It took too many turns to get to the meat of the game, and worst of all, the last 3-5 turns drug horribly while AP-prone players maximized card play. That said though, I could feel something there. Although tedious, the game stuck in my head for days. That “head stick” is usually my oft ignored subconscious telling my conscious that it needs to relax and take a back seat during another play or two to allow the game’s good bits to shine through. Quite simply, Macao wouldn’t be the game that it is without the dice/cube-allocation mechanic. The windrose is at times both wonderful and a harsh mistress. Play your cards, or in this case, choose your dice wisely and you can clean up. Choose poorly, and you’re sunk. I find the card drafting, at times, interesting and integral to play but it’s not my favorite part of the game. Each round tends to slow down a bit as players try to maximize the order of and the actions their “built” cards afford given the cubes available for their turn. Players can plan ahead to some degree but opponent play can affect the choice of actions. The final turn or two can be chock full of cubes as players try to maximize their ability to earn end game points. I’ve played Macao with all supported numbers of players but I was pleasantly surprised at how well it plays with only two. It’s rare, in my opinion, to have an interactive game involving card drafting, variable turn order, etc. scale down that low. On the other hand it feels like it would work with five as well but I suspect the down time would get inordinately painful. 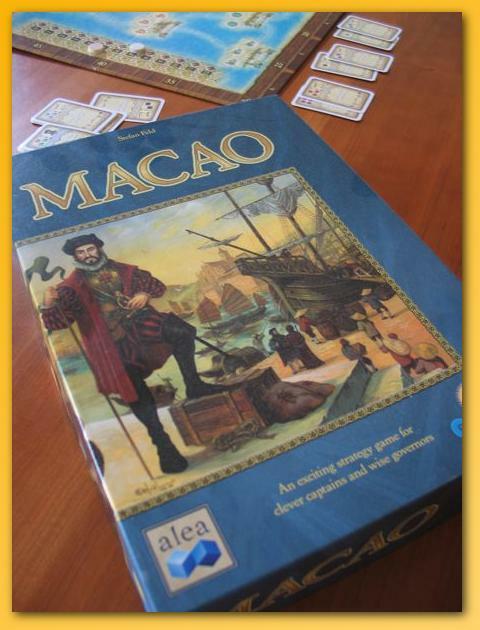 All in all, I like Macao and would recommend it to everyone who likes a meatier game (yet still relatively light in the grand scheme of things) especially if you’re looking for something of its weight that scales down to two. My wife and I have had great fun playing it and she gives it the nod over Egizia. Firstly, thank you for the concerned emails about my lack of posts. I’m doing fine but struggling to find time to play games and write session reports lately. I had my main “business” machine crash on me but I didn’t lose any data since I keep everything on a remote RAIDed network storage device. However, I’ve taken the opportunity to make the full switch to the Mac environment given that the dead machine was the last Windows-based holdout in an ever increasing Mac-household. Unfortunately, the Windows machine was where I kept the books for my software consulting corporation and my e-photo organization software. As a result of the switch, I’ve been spending a large part of my existence (in addition to the normal work load in everyone’s life with two sports playing kids), getting gaming & family photos organized in new software (some 20,000 images!) and getting my company books back up and going so I can run payroll, etc. So, yes, it’s been weeks (months!) since my last post and you can expect a much slower posting rate in the foreseeable future. However, please stick with me. I’m not out of the hobby by a long shot and look forward to getting back into the swing of things.